Solvent ink | Ink | MIMAKI SINGAPORE PTE. LTD. Excellent weatherability and rub-fastness! The standard ink for beautiful indoor and outdoor signage. In the ink, the pigment is dispersed in an organic solvent, and thus the ink is quick drying due to the volatility of the solvent. This property enables direct printing onto PVC, which are extensively used for both indoor and outdoor signage and displays. In addition to excellent weatherability and rub-fastness, our unique inkjet technology provides super-high picture quality without a granular appearance. Furthermore, “ease of maintenance” and “cost effectiveness” are also favorable features of this ink. Mimaki solvent inks are reputed worldwide for their beautiful long-lasting nature and are used as a standard ink for signage printing. Solvent ink [SS21] and [BS4] gained the "GREENGUARD Gold" certification by UL LLC of third-party institution of safety science of the United States. 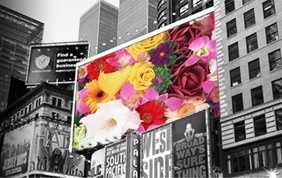 From text and illustrations to photographs and backgrounds with gradations, the combination of Mimaki’s unique inkjet technology and solvent ink delivers vibrant and less-granular super high quality print results. The solvent ink enables direct printing onto PVC, the most popular media for signage display printing, as well as on non-ink-receptive layer coating media. Mimaki solvent ink ensures signage and display production that is cost effective. Simultaneous layer printing is very effective on transparent media; color printing on white underlayers gives a more vivid impression. In addition, the combination of full color ink with silver ink allows a more vibrant expression of the metallic colors such as gold, silver, and bronze. The solvent ink prints are ideal for outdoor signage. The prints show little fading/degradation because of direct sunlight, and have high weatherability in rain/snow, and they also have high rub-fastness. * Depending on print media, laminating may be needed, please contact us for details beforehand. SS21 and ES3 both showed very little fading even when in an accelerated test equivalent to 3 years. New technology has further improved the durability of the solvent ink and has enabled the printing time to be markedly reduced. 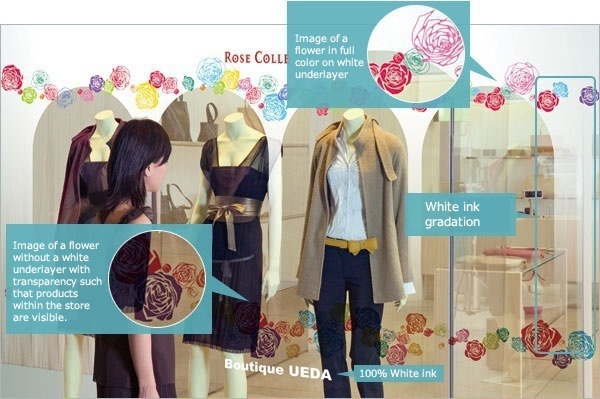 This inkjet printing technology with a solvent UV ink was first developed by Mimaki in 2013. The pigment is adhered by volatilization of the solvent components and quick drying by UV curing to provide a glossy finish. Thus, work efficiency has been dramatically increased and the rub-fastness has also been improved. 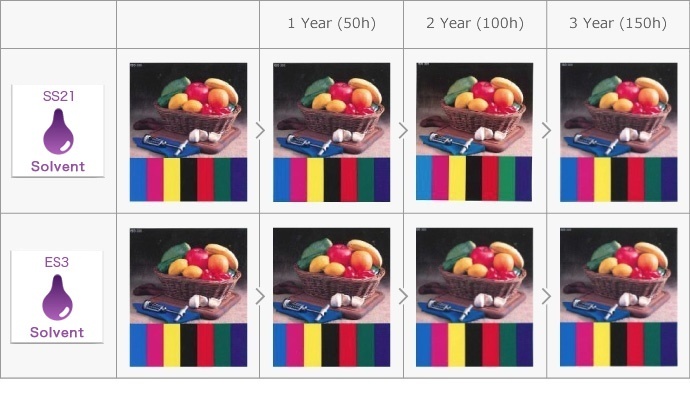 The ink cures immediately upon printing, meaning that drying time is not needed and an immediate transition to the processing stage is possible. No drying time needed! Prints are ready to be processed right after the print! The solvent UV ink is both cured and adhered at the time of printing; thus, drying time need not be considered. Secondary processing such as lamination can be performed immediately after printing, which significantly improves process efficiency. High solvent-type ink has excellent durability and is ideal for outdoor signage (HS ink). Low solvent-type ink that is in high demand for the production of signs and displays for both indoor and outdoor use（SS21 ink). Eco-friendly ink that does not require any special ventilation facility (ES3 ink). 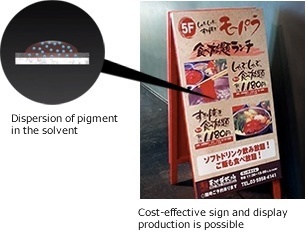 The solvent UV ink (SUV ink) offers a new approach for the expression of signs. No need for specialist machine operation or maintenance, very easy to handle. Another major advantage is the wide range of available printers, which range from high-end to affordable entry models. Solvent ink [SS21] and [BS4] gained the "GREENGUARD Gold" certification. With the current rise of desire for environmentally-minded products by consumers, the interest of the "value of environment" is growing. GREENGUARD is a program of the environmental certification on chemical emissions of indoor spaces by UL LLC of third-party institution of safety science of the United States. Based on the backed information by the unbiased empirical science data, the products with less chemical emission to the room spaces and more environmentally-friendly can be approved to this certification. The certification has two sorts such as the Standard and the Gold. The Gold offers more strict certification criteria than the Standard. Mimaki took the lead of the market to develop ink, ink-jet printer industry to reduce environmental impact. Especially the sublimation printing is becoming attractive as its environmental-minded system. Mimaki continues to pursue the print technology of high-quality and to strive to reduce its environment impact for the realization of environmentally-friendly manufacturing. It will aim to continue offering products and services considering the safety and security of our valued customers.